The IBM System i, then known as the AS/400, was the continuation of the System/38 database machine architecture (announced by IBM in October 1978 and delivered in August 1979). The AS/400 removed capability-based addressing.The AS/400 added source compatibility with the System/36 is combining the two primary computers manufactured by the IBM Rochester plant. The System/36 was IBM's most successful mini-computer but the architecture had reached its limit. The first AS/400 systems (known by the development code names Silverlake and Olympic) were delivered in 1988 under the tagline “Best of Both Worlds” and the product line has been refreshed continually since then. IBM AS/400 is actually not a mainframe from a hardware point of view, precisely said its an midrange server, but philosophy of operating system is very close and available for “getting to know” about mainframe technologies. We have one such machine in our hackerspace and there are people who are interested in gaining skills with this technology. Figure 3: Our As/400 black case. S1 - (has a square-wave-form symbol). To be able to connect via this port AS400 needs to be in Standby Operation mode (02 M). 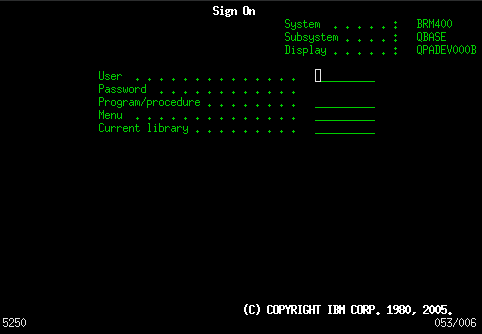 Then You can connect using serial cable from your Operations Console computer and open the ASMI in serial mode. J11 (remote power on); J14 (UPS); J15 (SPCN 0); J16 (SPCN 1). A blinking light indicates power to the unit. A constant light indicates that the unit is up and is working. In order to select to which console output will be sent hold “space bar” key and PowerOn. There are following console types. Thin Console - Neoware c50 thin client running a customized Linux image, which includes an IBM 5250 emulator. It boots from internal flash memory. Various alphanumeric codes will be shown on the display panel. That means the system is booting fine. Wait few minutes. If it will be stuck at some alphanumeric code for more than few minutes, just google that code and you will know what is broken. select function 08 using arrow keys on the front panel of server and confirm question 0? by pressing twice white button. - loads a copy of the Licensed Internal Code that has both the Temporary and Permanently applied PTFs. This is normally your most current or newest code. You would use the B side most of the time, especially for routine work. You would run from this side when you permanently apply certain PTFs. C - reserved for hardware service representative use. D - installing and reloading programs. This loads the system programs from an alternate IPL load source, such as a tape drive or CD-ROM. You would also use this if your load source disk had failed, or installing a new system. You can both “scratch” install a system (initialize it) at this point, or just replace the license internal code. For booting from CD you need disc labelled “1BASE LIC MACH. CODE”. For installation “B2995 01” and then “B2995 02” - you'll be requested to change the CD on the appropriate time. For some Disk maintenance & management. IPL speed is changeable while the system is powered off. F Fast override for one IPL. Fast IPL run. Some hardware diagnostics are skipped. * Extended Logical Built-in Self Tests. SE Hardware upgrade. Support-directed procedure only. V Fast IPL or slow IPL set by the system value (selected at function 02). Function 02 selection or the system default at each IPL. If there is an error code a6005008 on display, a console is either off, in wrong port (for Twinax must be port 0, address 0 to be the system primary console) or misconfigured. There is a good howto on midrange.com ML about configuring the console from the front panel. (If you go from 65+21 to 11 to see your changes wait a little bit, it takes ~5-10s to apply and display correct values). System *probably* must be in the manual IPL mode. You can view and change settings of the Twinax console itself using Shift-SetUp keys - remember it should be configured to be port0, address 0 and one display only. Telnet 5250, or TN5250 describes either the process of sending and receiving 5250 data streams using the Telnet protocol or the software that emulates a 5250 class terminal communication via that process. TN5250 allows a 5250 terminal emulator to communicate over a TCP/IP network instead of an SNA network. Standard telnet clients cannot be used as a substitute for TN5250 clients, as they use a different data stream format. Instalation must be performed in mode 01 A M V=F.